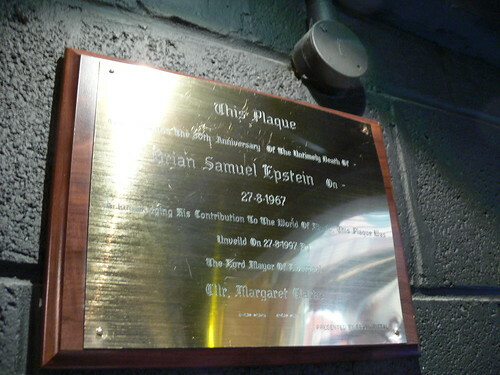 The Brian Epstein Plaque inside The Beatles Story Exhibit in Liverpool, England. Brian Epstein, the Beatles manager who brought the Beatles out of Liverpool and engineered their success, was remembered yesterday throughout the city of Liverpool on the 40th anniversary of his death, August 27, 1967. Last night's Liverpool Beatles Week concert at the Empire theater featured some original Merseybeat bands from the late fifties and sixties and the concert was dedicated to the memory of Brian Epstein. 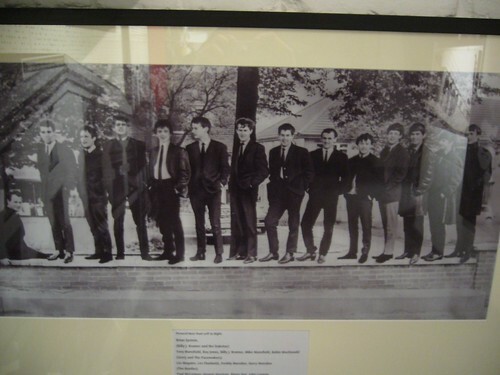 Brian had helped launched Gerry & The Pacemakers and was well known by local Liverpool groups. Other bands that played were Karl Terry, The Undertakers, The Searchers and The Fourmost. 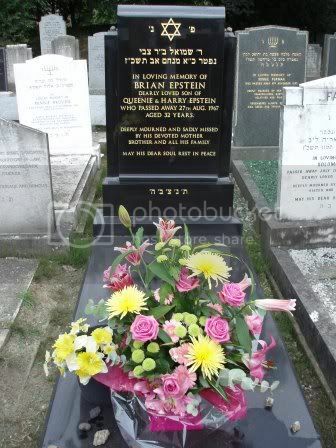 A special memorial ceremony to remember Brian was held at the Jewish Cemetery on Long Lane, Fazakerley, Liverpool, where Brian's gravesite is located. It is a mystery as to who brought the beautiful flowers that are shown in this picture. 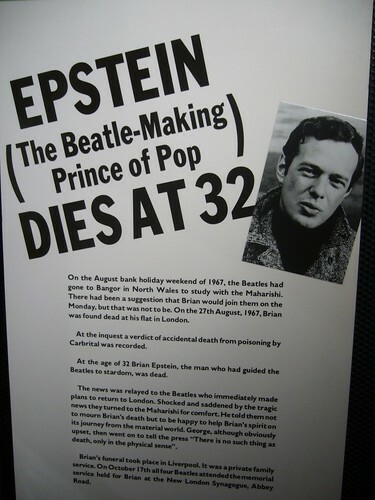 The Beatles Story in its gift shop throughout the day displayed 40 Years Ago, Brian Epstein died, August 27th, 1967. Remember Brian on its large plasma display screen above the cashiers. Additionally the Beatles Story displayed new items for the new Brian Epstein 40th anniversary memorial exhibition that opened up on Sunday. To commemorate the life and times of this remarkable man, the Beatles Story will be exhibiting a wonderful collection of previously unseen photographs, books and other items, all of which have been generously loaned by an American collector, Katie Hickox. -A discarded note written by Epstein in his handwriting which features a lyric Brian is alleged to have written for Paul McCartney. It is believed that Brian was keen to relieve some of the pressure on the Lennon / McCartney song writing team and that the note reveals his own attempt at composition. -A previously unseen photo of Brian Epstein featuring the Beatles and two other acts on his 'stable' of performers, Gerry and the Pacemakers and Billy J Kramer and the Dakotas. 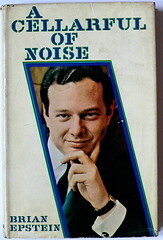 -A rare signed copy of Epstein's 1964 autobiography, A Cellarful of Noise. -A number of photos and documents taken from NBC's archives which feature Epstein and the Beatles on their first trip to the USA in Feb 1964. -A 1967 picture of Epstein taken at the Disc and Music Echo awards where he can be seen chatting to the Monkees' Micky Dolenz. The photo also shows DJ Jimmy Saville enjoying a trademark cigar! A number of these fascinating artefacts were originally given by Epstein to his chauffer Bryan Barrett for safekeeping shortly before his death in 1967 and were originally put up for auction in April 2000 at Christie's. Director of the Beatles Story Jerry Goldman said: "We are delighted to be able to mark this anniversary and acknowledge Brian's enormous contribution to the world of popular music. Without Epstein there might still have been the Beatles but the story would be entirely different." The Beatles Story exhibition at Albert Dock, Liverpool, allows visitors to experience Beatlemania firsthand. To mark Liverpool becoming the European City of Culture in 2008, the exhibition has been revamped using the latest technology. Highlights include a BBC radio interview with Brian Epstein, unheard for 30 years, and also specially recorded contributions from Cynthia Lennon and Sir George Martin. There are original Beatles exhibits as well as one off recreations like the one of the legendary Cavern Club - a unique olfactory experience as it comes complete with basement smells! The audio tour which takes in all these new additions has been narrated by John’s sister, Julia.